Culms: Erect or bent abruptly upward at bases, solitary or tufted, glabrous, nodes dark. Blades: Flat, .5 to 4.5 inches long, less than 1/5 inch wide, erect, glabrous or slightly pubescent, ridged above. Sheaths: Shorter than internodes, glabrous or pubescent. Ligules: Short, membranous, irregularly notched to short-fringed. Inflorescences: Racemes, spike-like, narrow, erect, 1.5 to 3 inches long, to 3/5 inch wide, sometimes partially enclosed in uppermost sheaths. Spikelets: 3 per node; central spikelets 1-flowered, fertile, sessile; lateral spikelets smaller, sterile, short-stalked; central spikelet glumes lanceolate; outer glumes of lateral spikelets awn-like, other glumes with awns 1/4 to 1/2 inch long; lemma of central spikelet with awn to 1/4 inch long; lemmas of lateral spikelets short-awned. Habitat: Open disturbed areas and waste ground, most abundant on dry or alkaline soils. Forage Value: Little barley has little forage value. It becomes dry and unpalatable in June. 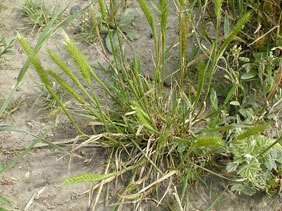 Comments: The presence of little barley in a pasture can be an indication of overgrazing.